Księżyc (Polish for ‘the Moon’), who were present for two decades only on low-budget records, cassettes, and the Internet, has managed to attract a much larger audience, including many who don’t speak Polish. The first sign of Księżyc’s comeback from a state of suspension, in which the band had willfully remained since the 1990s, was the vinyl reissue of their debut album by the British label Penultimate Press in 2013. A year later, the Polish label OBUH reissued the album on CD. 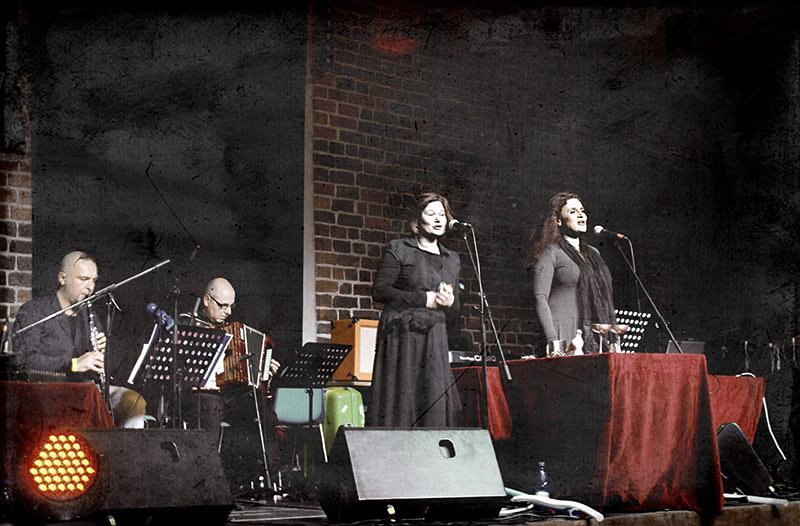 The releases were followed by Księżyc’s concert at Unsound Festival in 2014 – the band played in the 14th-century Saint Catherine Church in Kraków. The event sold out a couple of weeks prior, and most likely drew the biggest audience in the group’s history. At the Kraków concert, Paweł Romańczuk (musician, instrument constructor, composer, and founder of the group Małe Instrumenty) performed together with Księżyc. [musically] I was shaped by my two grandmas, both coming from the Polish-Belarusan-Lithuanian borderland territories, and my nanny from Sudan; the German part of my family was musical, too. 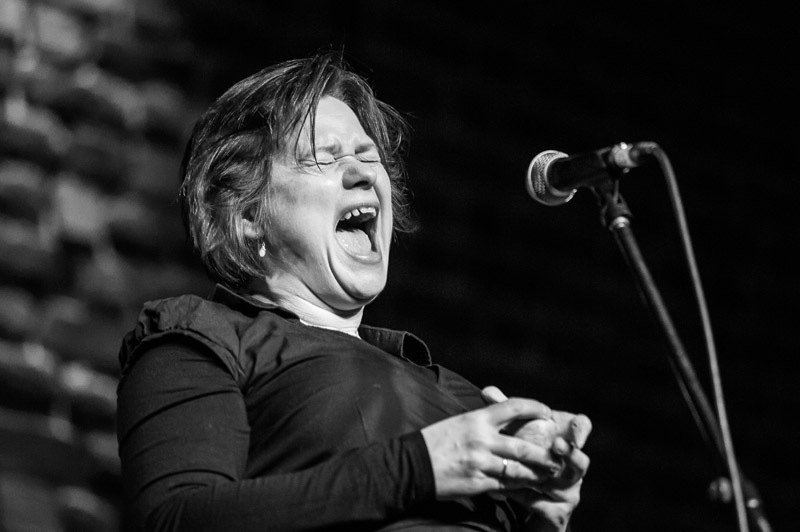 Olga implanted a sensitivity to Ukrainian melodies and local folk polyphony in us. In 1991 Księżyc was appreciated for their concert at the Student Song Festival in Kraków. The female trio played together with Leszek Polak and performed the song Panny, a musical adaptation of Miron Białoszewski’s text. Less than a year later, Robert Niziński joined the band. In 1992, the line-up temporarily changed – Olga left the group, and Leszek went abroad for some time. The smaller, four-person group that subsequently emerged (Agata Harz, Katarzyna Smoluk, Remigiusz Hanaj, and Robert Niziński) played a curious concert in the abandoned Church of St. Vincent in Wrocław, where they were invited by Mirek Koch due to the release of the next issue of the art/culture magazine Xuxem. It was most probably at that time that the group’s style was described as ‘music for girls with lake-like eyes’. Fragments of this performance were later used on the band’s first release – the single Nów issued by OBUH Records thanks to Wojtek Czern. On the debut album Księżyc (1996), Slavic folk meets psychedelia, and the music resists being assigned to any single genre. Acoustic instruments, such as the clarinet, Niziński’s saxophone, and Polak’s accordion, are equal to electronic instruments (used by both artists). Hanaj is responsible for the lyrics, and the mood ranges from archaic to weird, melancholic to grotesque. The artists call it the music of growing up, with all the anxiety and strong emotions characteristic of this period in life. They list Meredith Monk, Steve Reich, Arvo Pärt, and Dead Can Dance as their inspirations. Paradoxically, once the album was released the band played less and less. The record could be thus treated as a sort of an artistic summary of the group’s work in the 90s. Księżyc waned, entered a sort of a coma, and the members of the group went their own way. Agata Harz and Remigiusz Mazur-Hanaj began to co-create the Warsaw scene, playing raw music and establishing bands like Pies Szczeka and Wędrowiec. They also did thorough ethnomusicological research to examine Polish traditional music by acquiring information from elderly musicians, and keeping most of its peculiarities and treasures alive for the next generations. The remaining members, Smoluk and Polak, weren’t pursuing music careers. Niziński went in the direction of interdisciplinary work – he created music for plays and films, sound installations, and his own audiovisual projects. As an instrumentalist and improviser he also collaborated and gave concerts with artists connected to the Strefa programme (The Laboratory of Centre for Contemporary Art Ujazdowski Castle, curator: Andrzej Załęski), musicians associated with Monotype label, and the formation Za Siódmą Górą, established by the founder of OBUH, Wojtek Czern. The popularity of Księżyc’s debut album rose as time passed. The album’s originality, especially compared to other productions of that time, was alluring – hence the reissue initiated by the British label. The event gave rise to huge agitation among fans both at home and abroad. Questions about hypothetical reactivation and the group’s return to playing live were asked. Venues have always been of importance to Księżyc. They have never played in typical concert halls. Already in the 90s they would choose places such as the clock tower (Poznań), a secluded factory (Norblin factory in Warsaw), castle chambers (Bytów), water tower (Konin), or old churches in Wales. After their reactivation, the context for the performances changed. The band started playing at big festivals and in low-key clubs. They visited the famous Huddersfield Contemporary Music Festival, Kraak Festival in Brussels, and, on the other hand, the famed Cafe Oto in London. The album Rabbit Eclipse, released at the end of 2015, presented Księżyc in a strongly modernised version. Only one song characteristic of the old style was left; the remaining ones were longer, more trance-like, and it was minimalism and 20th-century experimentation that they resemble more than folk music. Tapes from field recordings and deep, drone-like sounds are a crucial part of the album. Remigiusz Hanaj took up the hurdy-gurdy and the violin. The album was recorded entirely in Królikarnia Palace in Warsaw, using the natural reverberations of the place. Hanaj called one of the pieces created during the sessions a ‘sound sculpture’ (Królikarnia houses the Xawery Dunikowski Museum of Sculpture). It was also there that the band performed in Spring 2016, giving a free concert. The audience, sitting on the damp grass, remained focused for the entire time, the pure sound resonated with evening bird songs, the buzz of the street, ambulances passing by. Księżyc turned out to be a band created not only for contemplating temples and forgotten factories, but also the open sky – this corresponds nicely with the grander space for improvisation and interpretation that the musicians created while reactivating the band.